This is Lauren! I hijacked Preston's blog for this post! Baby Gabe was born on rainy November 6th at 10:13 in the morning. He arrived a few weeks earlier than his expected due date, an early November surprise! We have been praying for him ever since we found out about the tiny life inside me last March. In July we discovered our precious baby was a boy and Preston and I decided to create a Woodland themed nursery for him! These past few months we have been eagerly awaiting his arrival and piecing things together for his room. Friends and family joined in to help make our nursery extra special with their own unique creations. At the bottom of this post we listed where almost everything came from and the links for more details about them! We hope he enjoys his new home that so many people worked hard to make special for sweet baby Gabe. 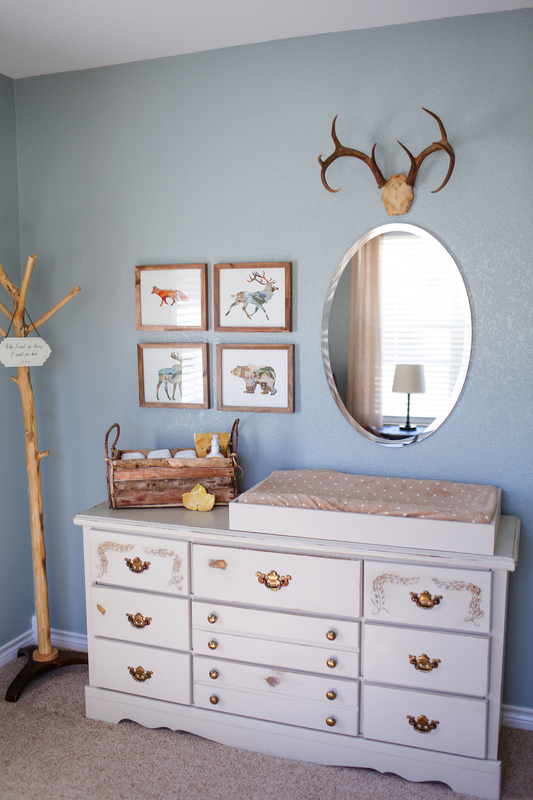 Changing table dresser & basket: purchased from Junque in the Trunk in Waco, Texas. Gabe's dad, Preston, added the framing around the changing area on the dresser. Crib Mobile: Felt woodland critters handcrafted by Gabe's Nona Cheryl, the rest of the mobile put together by Preston! Fox and Bear Stuffed Crib Lovies : Gabe's Nona Cheryl! Cedar Side Table: Made by Preston from a stump in our backyard, see the tutorial here.